Almost all drivers in St. Louis have roads and parts of the city they like to avoid, but what does the data say about the worst places to drive in St. Louis? The St. Louis Post Dispatch published a map of the 10 most dangerous intersections in St. Louis. Its data came from 148,000 reports of car accidents in the area in 2015. These are the places where drivers in St. Louis are at the greatest risk of being injured in a car accident. Driving is the riskiest thing most people do in their lives. Your chances of being in a car accident at some time in your life are much greater than your chances of being injured in many of the apparently dangerous things many people fear. The good news is that St. Louis is generally a safe city for driving. 148,000 car accidents in a year may sound like a lot, but considering the population of St. Louis is over 300,000 that number isn’t as significant. Also, consider that many of the accidents reported were minor and did not result in any injuries. Here is some findings of the St. Louis Post Dispatch report. Three of the 10 most dangerous intersections are located on IS 64, namely its intersections with Spoede Road, ERM East IS 64 Mile 326, and Kingshighway Boulevard. Only two fatalities were reported at the 10 most dangerous intersections in 2015, one at the intersection of Mid Rivers Mall Drive and IS 70, and the other where Salisbury Street intersects with IS 70. The most accident-prone intersection in St. Louis is Dorsett Road and IS 270. In 2015, it was the site of 149 accidents, which resulted in 48 injuries. In general, the number of injuries at each site was proportional to the number of accidents. What Happens When an Intersection Is Too Dangerous? This might be the first time you have thought about how dangerous a particular intersection is, but personal injury lawyers think about this question all the time. Car insurance companies concern themselves primarily with figuring out which driver was at fault for every accident, but car accident injury lawyers look at the bigger picture. If an intersection is extremely dangerous, then it is possible for two cars to collide even if both drivers were exercising appropriate caution. If an intersection is set up in such a way that drivers cannot know when to slow down or stop to avoid collisions, then it is possible to name the city as a defendant in a lawsuit related to injuries sustained in the accident. This is because of premises liability, the same principle by which an injured party can sue the owner of the property where an accident happened because of his failure to keep the area safe constitutes negligence. St. Louis personal injury lawyers look at all aspects of the situation to help you get the compensation you need. 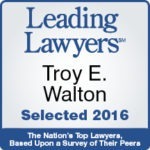 Contact Walton Telken Injury Attorneys in St. Louis and Illinois if you have been injured in a car accident. Steve Telken is a Personal Injury and Wrongful Death Attorney who practices in Edwardsville, IL and St. Louis, MO. He graduated from the St. Louis University School of Law, and has been practicing law for several years now. Steven Telken firmly believes in your case and will stand by you every step of the way. Learn more about his experience by clicking here. The information provided by Walton Telken, LLC in this Blog is not intended to be legal advice, but merely provides general information related to common legal issues. This Blog, and the information contained within it, is Attorney Advertisement. The choice of a lawyer is an important decision and should not be based solely upon advertisements. Past results afford no guarantee of future results. Every case is different and must be judged on its own merits. Can a Car Accident Really Be No One’s Fault?